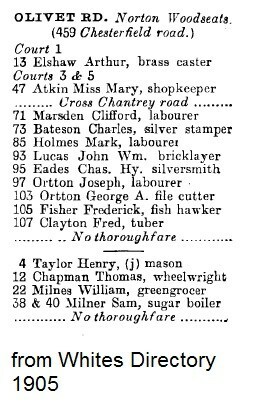 The Milners operated their own commercial transport from Olivet Road - possibly Mr Parker was delivering sweets to confectionery shops? By July 1920 their transport was motorised, Bert Milner of Olivet Road, in a commercial vehicle owned and driven by him, had a burst tyre near Fox House on the way to Hathersage, and turned over, injuring a passenger. To clarify, a ‘confectioners’ would have been a shop selling sweets (a candy store), rather than a bakery. 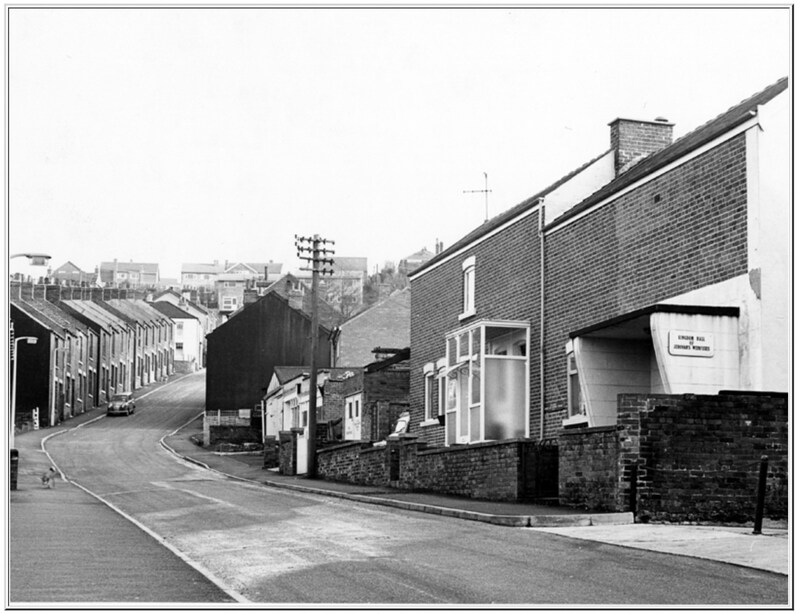 The buildings on Olivet Road look to have been extended substantially in the photo attached, which was in 1966, if the different coloured pointing is anything to go by? At this time it was a place of worship. 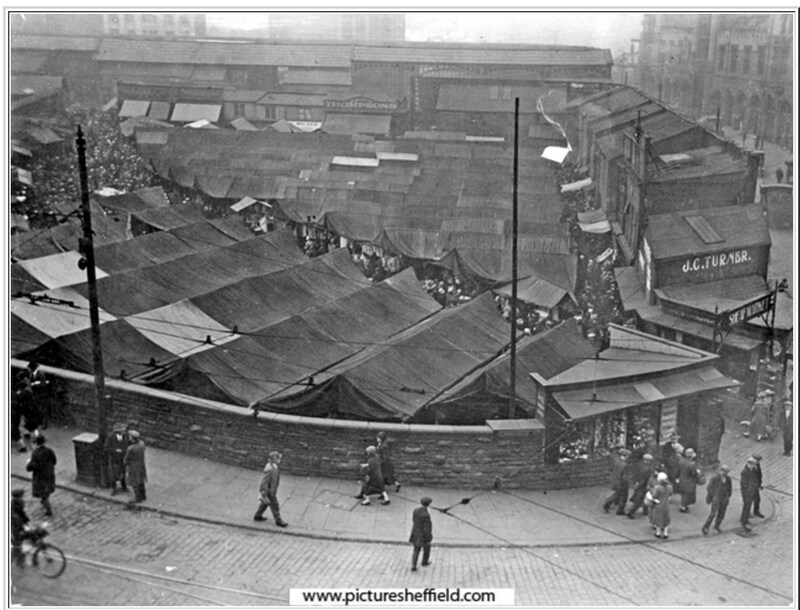 Also, a photo of the Sheaf Market (Rag-and-Tag) from the 1920’s, which is of the period you were looking for, but sadly no clue as to which is stall #11? Hopefully they will give a sense of the period and the surroundings? 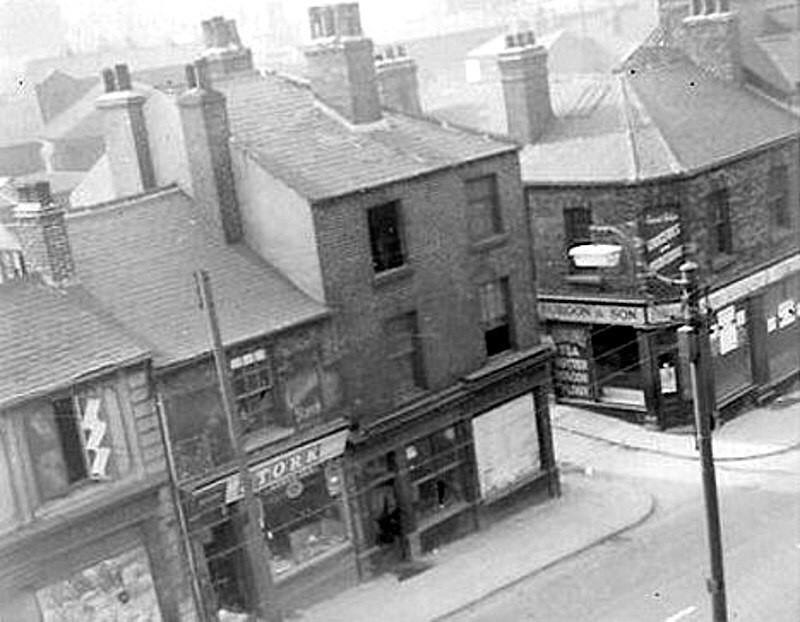 I just found a better one of the shop on Duke Street, this one taken from Embassy Court flats shortly before demolition of the shops . 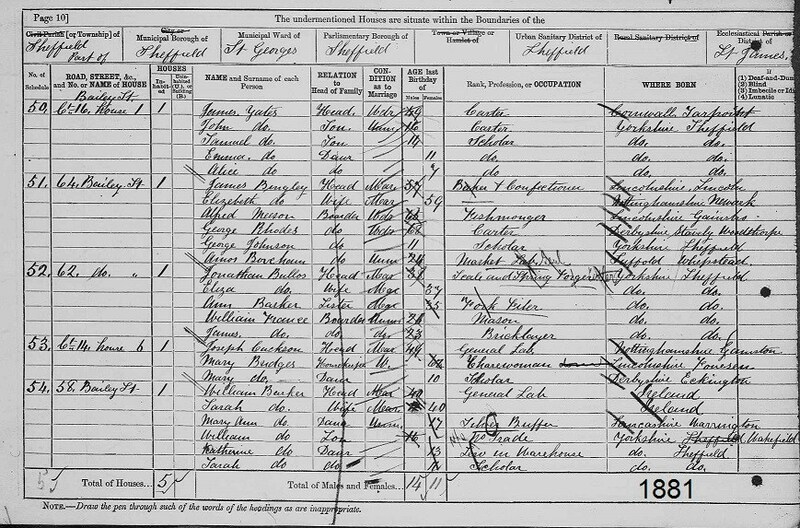 Interests:Researching PARKER family of Sheffield Union Workhouses: Mary Ann Parker b. abt 1867, and her children: Eliza b. 26 Nov 1886, William Henry born 10 Feb 1890, and Harry b. 24 Nov 1885 who became a Barnardo Boy sent to Canada in 1910. Still seeking info on Mary Ann and Eliza. My goodness, thank you so much for taking the time to have a look about for me!! This does help give a sense of his surroundings at the time. Also, this Milner family were quite well off by the sounds of it, and likely grandpa was hired on to do some of the deliveries as a 'drayman.' I do hope he stayed on and enjoyed this work before the 'call of duty' came. Wonder what became of this Milner family. Now to see if possibly can locate them and see if they have photos of any of the employees working for the business back then. Never know! Always hopeful. Again, thank you so much! Now to see if possibly can locate them and see if they have photos of any of the employees working for the business back then. Never know! Always hopeful. Again, thank you so much! There seemed to be many Milners about so there is a good chance some of their descendants are still around Sheffield. 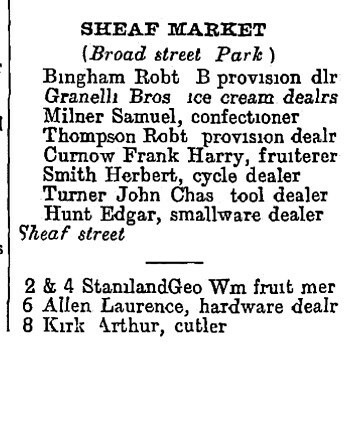 In 1911 Whites Directory there is a John Milner, also a confectioner at 59 Broad Street, Park . 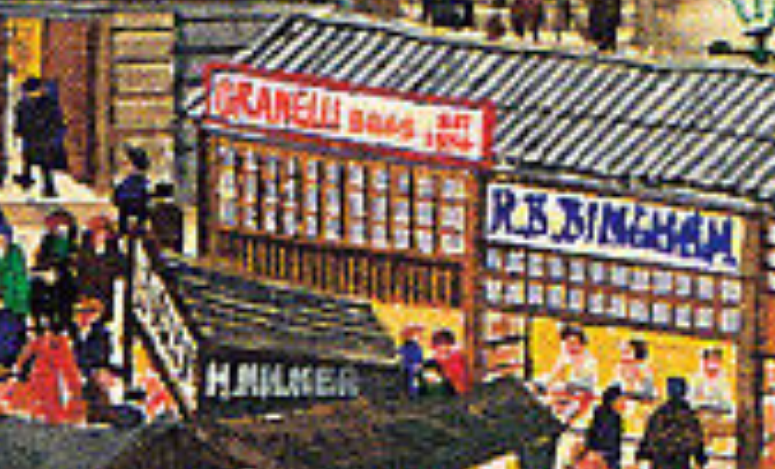 I also noticed that in the same directory in the Sheaf Market (Rag 'n Tag) that Samuel Milner, confectioner, is listed as being next to Peter Granelli, ice cream dealer, numbers 11 and 13 so I looked at the George Cunningham painting of the area and near Granelli's appears to be a H. Milner. 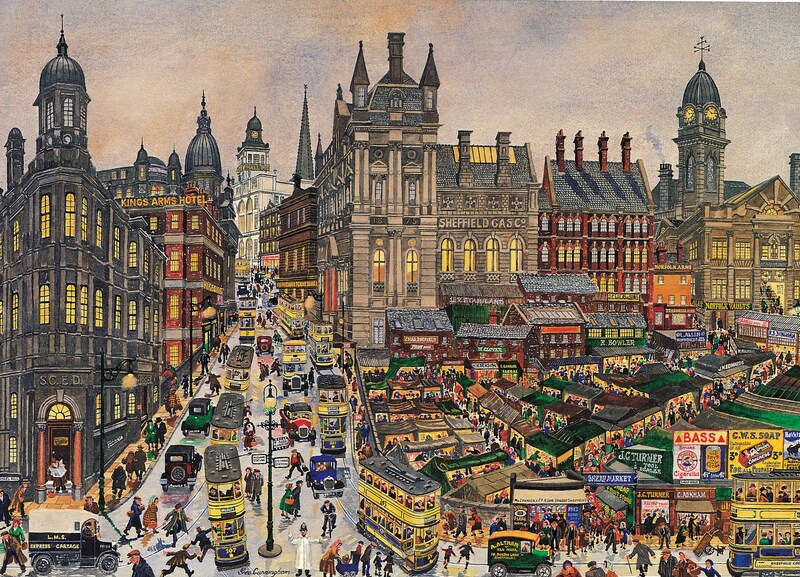 Though painted very much later it is based on quite an early year ( not sure what year) but the artist usually somehow seems to be quite accurate with signs. Horace Milner, employed at S J Milner as a sugar boiler. He was 22 years old, married with no children. His service was deferred until 31st December 1916 on the basis of 2 categories - A : "On the ground that it is expedient in the national interests , that the man should instead of being employed in military service, be engaged in other work in which he is habitually engaged" and E: "On the grounds that the principal and usual occupation of the man is one of those included in the list of occupations certified by Government Departments for exemption." H Milner, employed by Mrs J Milner as a sugar boiler. He was 18 years old and single. His service was deferred until 31st January 1918 based on category A. (above) and fitness category C1 (support duties only home or abroad). 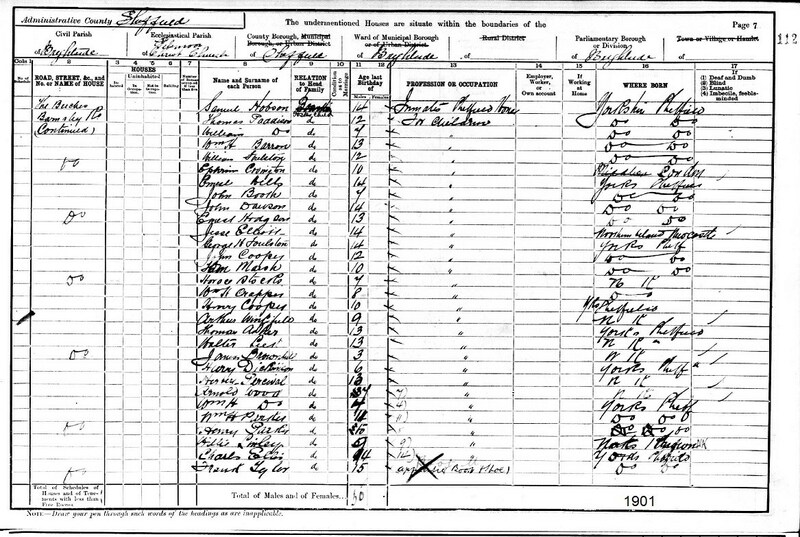 At the 1939 Census Horace Milner was a confectioner, dob 10.4.94 living at 38 Olivet Road, with wife Elizabeth. Next door at number 40 was Harold Milner, dob 17.8.99, also a confectioner, with his wife Edith. 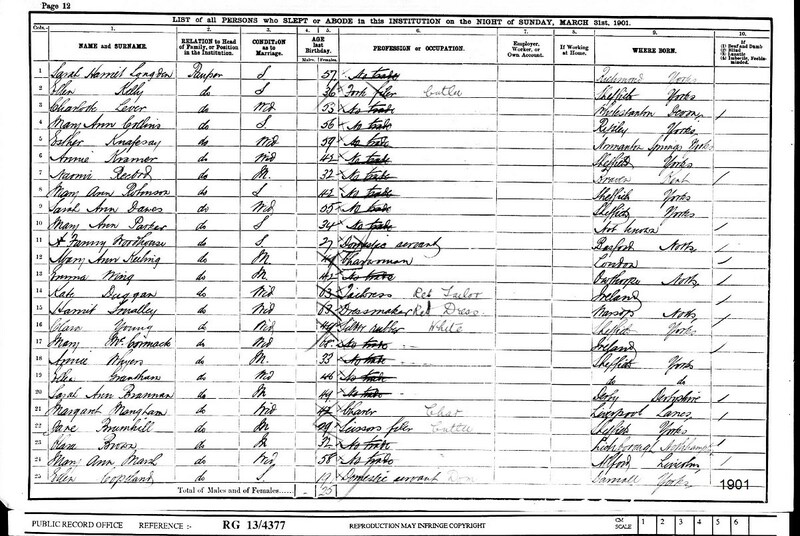 My grandpa was on the training ship called The Southampton in about 1905 and from there I don't know if he went with this family or ended up here after, but that is what I am trying to piece together. He was 'sentenced' to the training ship by the Board of Guardians in 1901, after being caught stealing pence at school. He was born 1890 and raised in the Workhouse/Children's Homes up to that point. In Dec 1905, after 4 years of being on the training ship, during an inspection on the Southampton, he is found to be too small and it was recommended he should be sent out to a farming situation, and that the training ship should only be for strong boys. 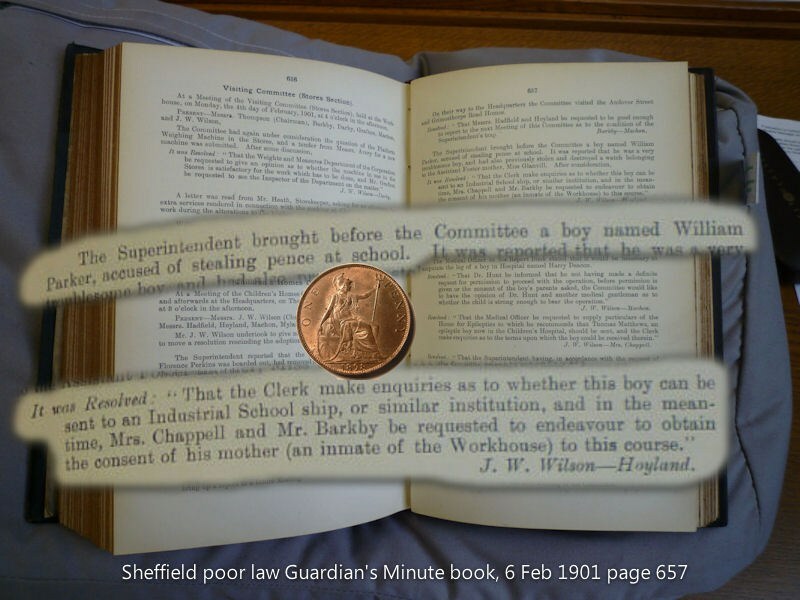 This info was found in the Guardian Minute Books held at the Sheffield Archives. Someone was kind enough to get that much info a few years back for me. So by this time, he would be nearing 16 years of age if taken off the training ship after that report. It is another 9 years before start of WWI, which he enlists, and it is those 9 years I am trying to find where he was and what he was doing. So for the 1911 census, that is half way between and gives me a glimpse. 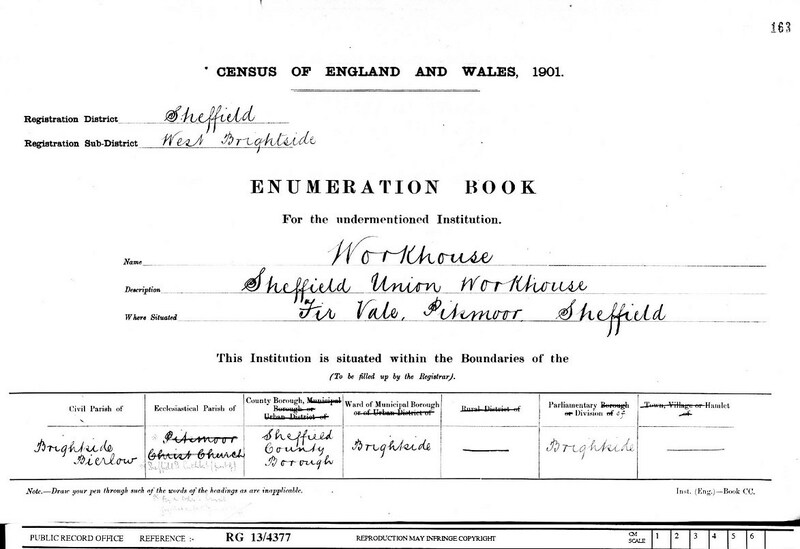 He is actually 21 by the 1911 census as his birth register shows he was older than he thought. His grave marker is off by 2 years. 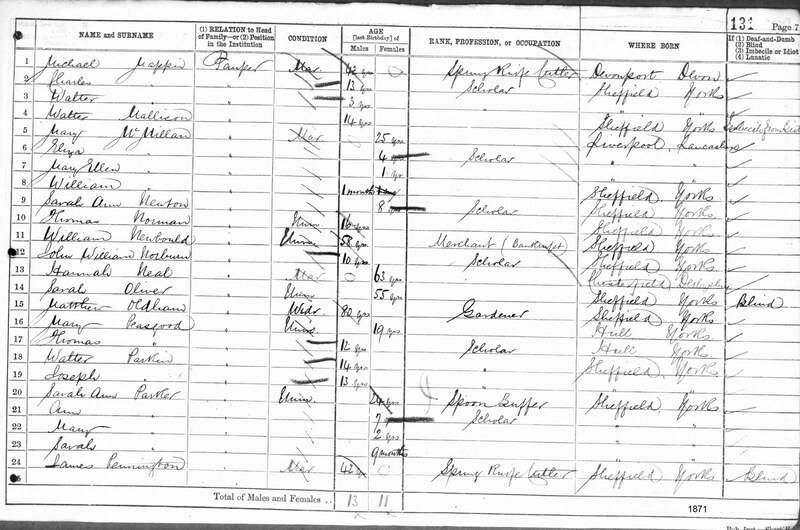 Most curious as to what he did from 1905 until the 1911 census. I know the answer will likely never be really known, but it sure is nice to slowly see what his life was about before coming to Canada. Hopefully he enjoyed the drayman job and stayed on there until he enlisted, where he continued on with horse, being with the R.H. and R.F.A. as a Driver. Thank you all so much for the photos and extra digging of information that I can't access over here! Much appreciated. 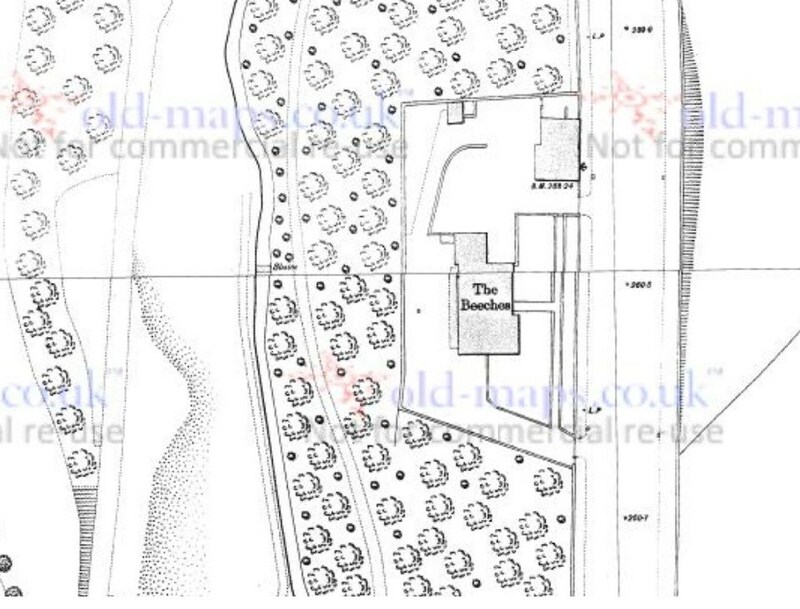 The Beeches was occupied by Thomas Collinson (Assistant Overseer and Collector of Poor Rates for Brightside, also Clerk of the Burial Board) and family until his death in January 1897, when the Guardians of the Poor attempted to rent it out. 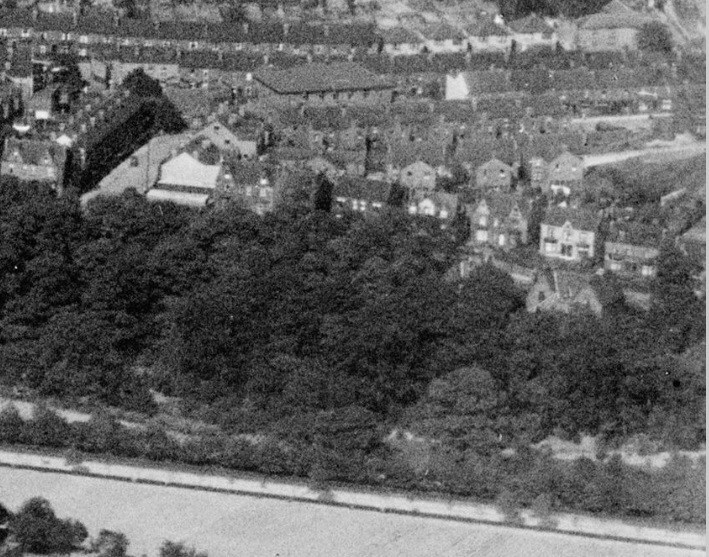 It later became (amongst other things) a nurses' home for the City General Hospital. 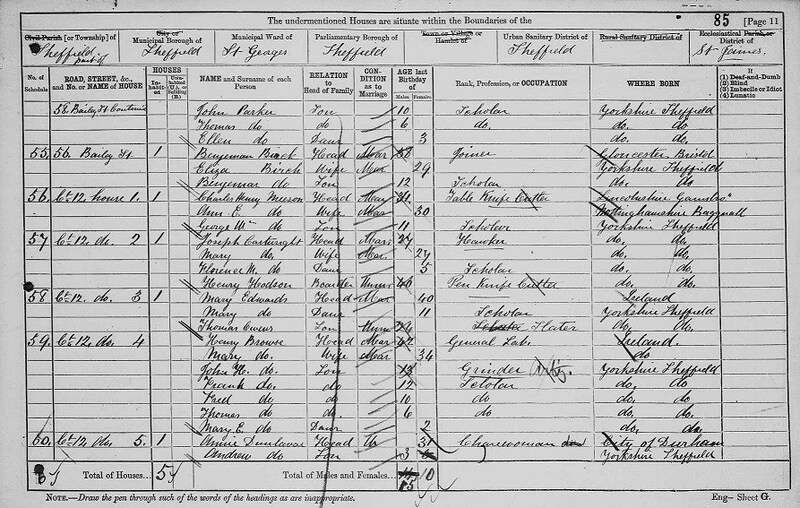 Here is the 1901 Census entry for Mary Ann Parker, William Henry's mother, who was in the Fir Vale Workhouse. The Mr Barkby referred to in the Guardians Minute book was Joseph Barkby (1834-1905) a mining engineer of Far House, Cricket Road, who represented the Park Ward on the Board of Guardians for seven years, and was chairman of the Estates and Works Committee, also a Primitive Methodist preacher. Mrs Chappell started on the Board of Guardians in 1984, and for nine years was the only female member of the Board, and she was especially involved with the poor of the Neepsend district. She and her husband John died within a few hours of each other in July 1927. 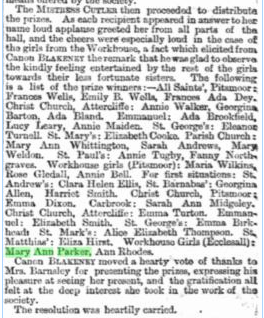 And in 1881 Mary Ann was a 13 year old scholar in the Ecclesall Workhouse - presumably she was discharged and hence became pregnant with William Henry. And here is two year old Mary Parker, in 1871, in the Ecclesall Workhouse, with her single mother Sarah Ann Parker (a spoon buffer by trade) and sisters Ann 7, and Sarah 9 months. Edmund, I could not be sure if that was her with a mom and sisters in the Workhouse (1871), or if a mention in the Sheffield paper (1878) of a child, Mary Ann Parker being in front of the courts for lying to actually get into the workhouse, stating her parents dead and was living in the Park, when they were not dead but living on Bailey St. Then again another news article 2 years prior (1876) that mentions of a child of 8 years old, Mary Ann Parker in the courts, in which her dad and a step mom (Martha Hodgson) had been ill treating her, they were charged/fined and then were back in court shortly after and conclusion was to send her to the Workhouse where father would pay for her keep. I sadly can't confirm which of those are actually her. 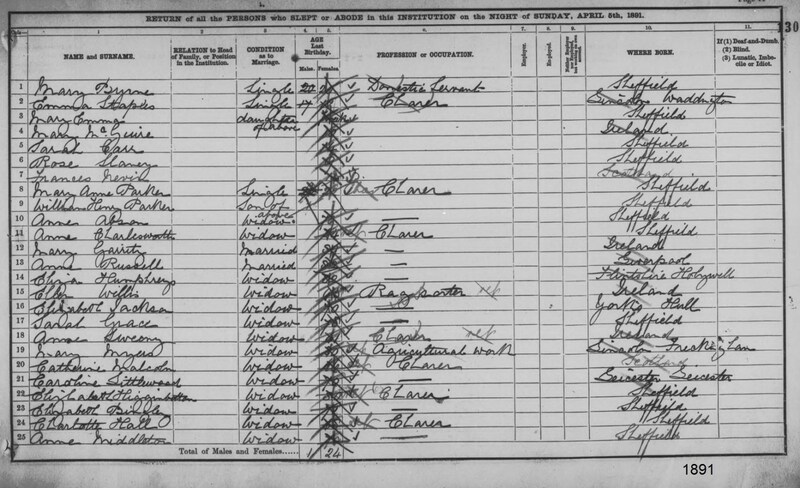 In the 1881 census, the 13 year old Mary Ann Parker, I always believed was her, but not sure which of those mentioned above ties in with her, or are they actually all her LOL. She would have had first child in 1886 (Eliza). Thank you so much again for your help trying to figure this out. I have clips of those news articles if you think I should post them here? Thanks, I am not think the Bailey St family is hers anymore now that I see that census you posted with all the names there. 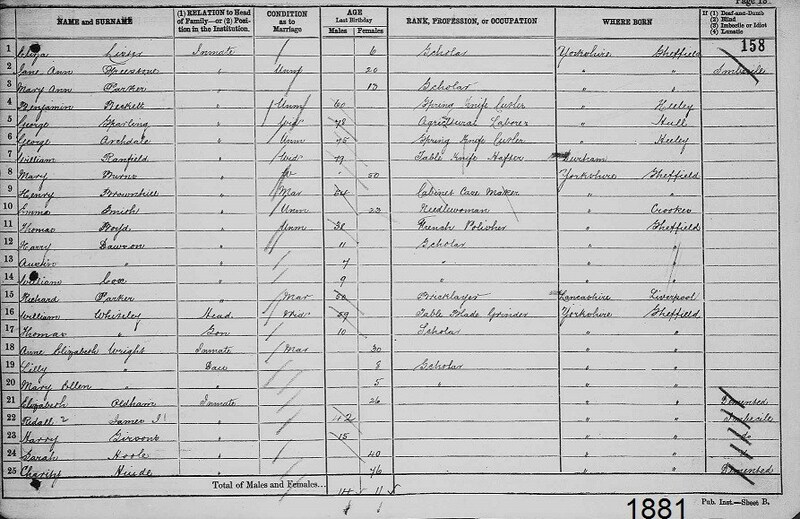 Better possibility is the other family on Walkley-bank road that mentions her, a dad, and stepmother, which is named (Martha Hodgson) before the courts, and Mary Ann being sent off to the Workhouse in 1876 is actually my Mary Ann, and then the following census at 13 years old shows her still being in the Workhouse. A sad start for her. Would there be any court records of this that would hold her Dad's name? Those are very likely my Mary Ann Parker, but have nothing at all to confirm it, even a birth registered document could not help. Only wish they had named the father instead of the stepmother. 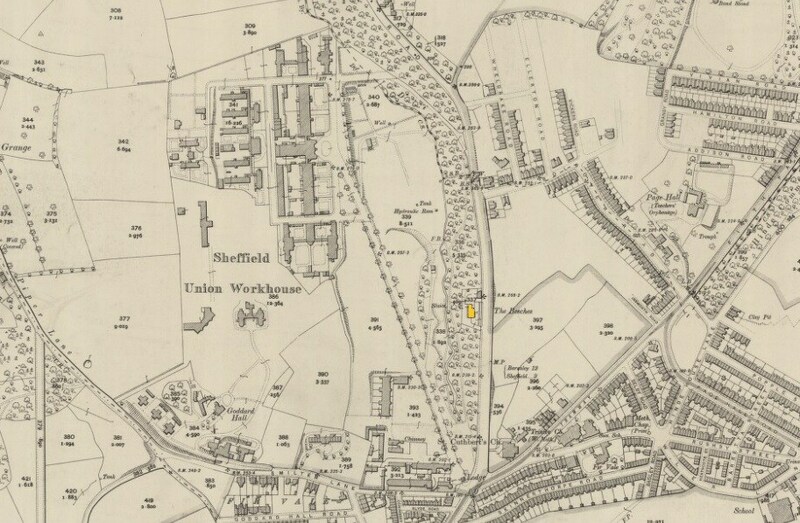 did a search of 2 yrs either side of 1868 for Sheffield district and also one for Ecclesall bierlow and only this came up. There was a Curley Family living on Verdon St Brightside in 1861. Possibly also a brother: John William Parker baptised at St Vincents (R.C) on 8th March 1869, record states mother's first name is Sara Cawley or Curley, father's name is William. Curley seems to be an Irish surname. I have my Ancestry DNA kit sitting here and don't have any Irish roots I know of, so if Irish shows up, that would be interesting. I think I should order the one birth record of Mary Ann Curley to start with while I wait on the DNA. Also aware of naming children after themselves or their parents and siblings. So will be watching for names of William, Henry, Eliza, Mary, Ann, and Harry. Thanks so much to those helping me along the way!! Lyn, would you be able to do 5 years before and after 1868 to see how many show in same area? Would like to see what other maiden names show for mother. Please and thanks! Dawn a quick search just for girls born in Sheffield 2 yrs either side of 1863 brought up over 30 matches without doing Ecclesall Bierlow. So it would be lots to post on here as Parker is a common surname. If you go to https://www.gro.gov.uk/gro/content/ and register so you can search freely without having to buy certificates unless you need to. It is a bit tedious because you can only do 2 yrs at a time but be methodical and remember to put in male of female and searching using both Sheffield and Ecclesall Bierlow. But better than Freebmd as it gives mother's maiden surname so long as she was married. If you get stuck you have my email address to contact me. I buy all old B & D certificates that way now as it is much cheaper. It is how I obtained Frank Freeman Newman's. 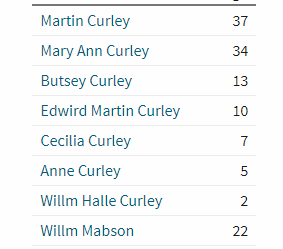 A quick flick through just brings up Mary Ann and John William with the Mother's maiden surname of Curley. Keep in mind the variations of Cowley or Cawley.